I would like to find a PDF tool to extract the text from my PDF files so that I can edit and copy the text as I want. Anyway, do you have this kind of tool to extract text from PDF? Do you have problem in editing the text of PDF files? Want to find a PDF tool to solve this problem without costing much? 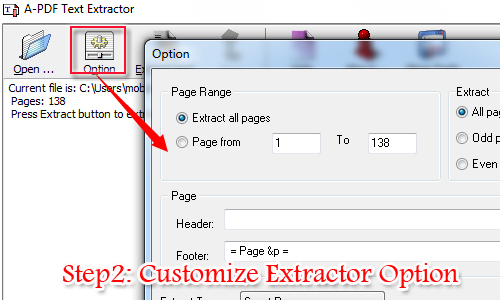 Then you can try this PDF tool A-PDF Text Extractor. First of all, A-PDF Text Extractor is users-friendly PDF tool. Then it is easy to get start without professional programming skill. 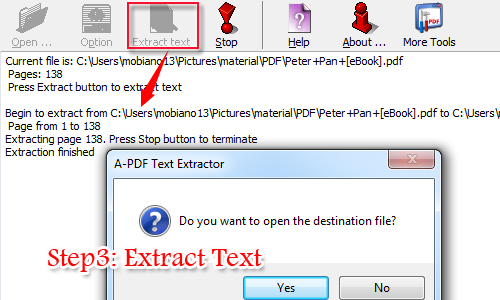 Now let’s show you the simple steps to extract the text by A-PDF Text Extractor. 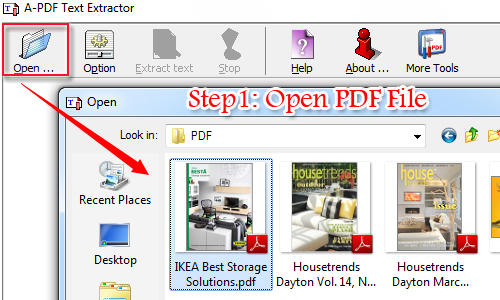 First of all, run A-PDF Text Extractor and then click "Open" and select a PDF file. And then it will remind you to extract button to extract text. Before extracting text, you are able to customize the option. For example, page ranges to extract text and extract type. After that, press "Extract Text" button to continue. And then it will remind you once it is done. And then open the text file you will see the content of PDF file and now you can edit the text easily. By the way, A-PDF Text Extractor can extract text from pure text of PDF but not the text on the images.